This small evergreen tree is located directly in front of Rand/Sarratt, not far from the Sarratt tunnel entrance. Eastern redcedar is a common and unique evergreen in our area. It doesn't really have needles, but rather, narrow,scale-covered twigs. It does not have woody cones of the typical sort, but produces fleshy, bluish cones that are commonly called "berries". There are no other similar native species in middle Tennessee. Redcedar is most commonly seen as a small or medium sized bush. It is very common along disturbed roadsides, especially on limestone outcrops. It can also grow into a fairly large tree if left undisturbed for enough years. Its ability to thrive on shallow limestone soil has given its name to cedar glades, a biologically important habitat common in the central basin of Tennessee. 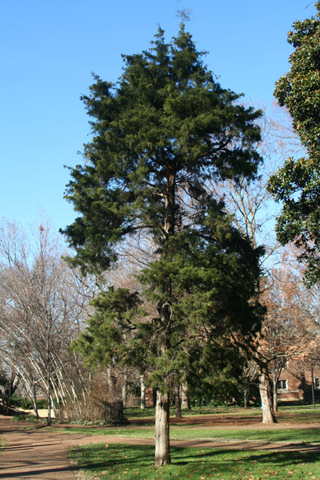 Despite its commonness there are few redcedars on Vanderbilt campus. This particular one is described on p. 42 of The Trees of Vanderbilt. This organism is a living specimen that is part of the  Vanderbilt University Arboretum  with the local identifier 2-856.